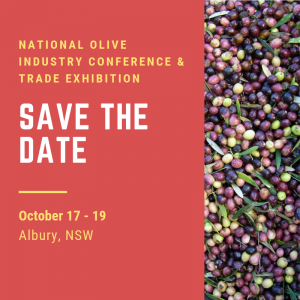 Members of the AOA can apply to become a signatory to the Australian Olive Industry’s Code of Practice (now renamed as OliveCare®). An affordable single fee now covers all certified products. Did you know that over 90% of the oil produced in Australia is covered under The Code? The take up of this Code amongst serious growers has been outstanding. The Code encompasses good grove management processes right through to high quality olive oils, flavoured oils, table olives and other olive products. Signatories are able to proudly display the well known triangle and other certified trademarks on their packaging. What are the benefits of OliveCare® membership? 1. 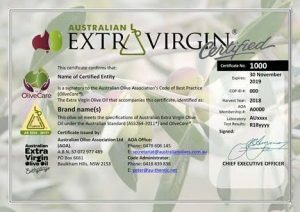 OliveCare® compliant members are authorised to use the Certified Australian Extra Virgin Olive Oil Trade Mark logo, which provides assurance to consumers that your EVOO product is authentic Australian EVOO that meets the AS5264-2011. AOA also has the following suite of trademarks for use on other certified products, POS materials and websites in accordance to the rules of use of these logos. These logos assist consumers in identifying ‘the good stuff’. 2. OliveCare® certified brands are also listed by state of origin on the ‘Everyday Australian Extra Virgin’ consumer facing website: australianextravirgin.com.au/brands/. Did you know that the EVOO Everyday Campaign is built around Certified Australian Extra Virgin Olive Oil, and other certified olive products? 4. Product Certification / Compliance Certificates are very popular with exporters to provide to buyers, and for other brand owners to display at farmers markets. The Australian Olive Association (AOA) working with River Murray Training (RMT) has developed 6 ‘e-learning’ modules (comprising a total of 10 on line interactive presentations) with the aim of building industry skills and facilitate implementation of the OliveCare® Code of Best Practice. Modules include Food Safety & Quality, Export Readiness and Sensory Training. These 6 e-learning modules are linked to Units of Competency from the National Training Framework (NTF), and can lead to a recognised VET qualification or Statements of Attainment eg from the Certificate III in Food Processing, or Certificate IV in Production Horticulture.